We have an integration for Node.JS / NPM already since a couple months. But the first integration was honestly not the best. The NPM crawler crawled the packages from the HTML page of npmjs.org. Because of that the meta information we had was not always complete. 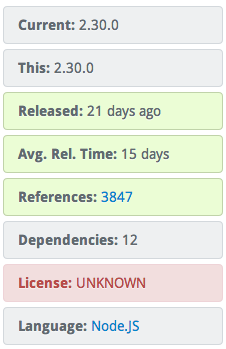 We specially missed the version numbers of the dependencies. The updated NPM crawler is now using the NPM registry. That’s why we have now much better meta information about the NPM packages. Now we can display the right versions of the NPM packages. Here are the dependencies of the request package. Beside the table view we can even display an interactive dependency graph with all transitiv dependencies. 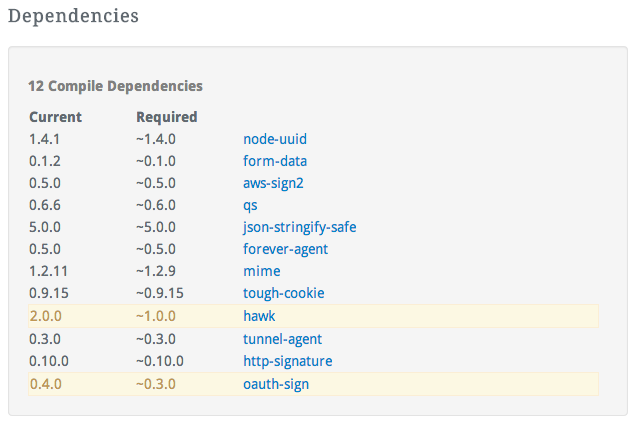 Beside the dependencies we display some NPM code snippets and the download link to the package. And because we have now all the release dates, we can show you the average release time of each NPM package. And some additional meta informations like references and license informations. There are 3847 other packages on NPM referencing the request package. That is a strong indicator for the quality of the request package.